This article was first published in the Laurel Historical Society‘s newsletter. The Nanticoke Indians who moved to Broad Creek in or around 1705 were, in many ways, a defeated people. In the nearly one hundred years since their ancestors had welcomed Captain John Smith’s barge with a barrage of arrows, their numbers, power, and wealth had diminished due to a series of wars and treaties. Even their reservation at the junction of the Nanticoke River and Chicacoan Creek was threatened by aggressive, trespassing English newcomers. This story would require many pages to tell. For the sake of brevity, suffice it to say that they were desperate and discouraged—but perhaps hopeful that they would be able to preserve their culture in their new home, farther inland with only a handful of English neighbors. The refugees settled near a site known as the Wading Place, which was one of the easier points at which to cross Broad Creek. It is possible that there was already a village or camp there, although the records seem to imply that the location was a new one for the tribe. Whether there was an existing Nanticoke settlement at the site or not, the land on both sides of the creek had been granted to Englishmen in the 1680s. The Nanticokes might not have been aware of this—or they might not have cared. Evidently the English did care, and told the Nanticokes that they might have to relocate yet again, for in October of 1711, the Maryland legislature was informed that “the Nanticoke Indians are much dissatisfied they may not be permitted to continue at Broad Creek where they are set down…” Perhaps indicating that the dwindling tribe was still a force to be reckoned with, the provincial government decided it would be unwise to evict them, and instead empowered commissioners to purchase and reserve three thousand acres on Broad Creek for their use. In a matter of weeks, surveyor William Whittington, Jr., laid out two tracts, one on each side of the creek. The northern tract consisted of the entire 2,500-acre tract known as Greenland, originally granted to William Green. The southern tract consisted of 500 acres on the east side of Little Creek, and included 133 acres of a tract known as Batchelor’s Delight, originally surveyed for Col. William Stevens, but subsequently transferred to James Wythe and Marmaduke Master. Note: The exact location of each tract, particularly that of the northern tract, is not entirely clear. The placement of the northern tract on the map below is largely based on shaky assertions about its western boundary made in deeds dated 1816. Personally, I am bothered by the fact that records from 1711 state that the southwestern bounder of the northern tract was on the east side of a small creek which does not seem to appear on modern maps or satellite imagery. I am also bothered by the fact that, according to this placement, the eastern boundary of the northern tract follows today’s Route 13, rather than the much older Alternate 13. It is possible that the entire northern tract should be shifted to the west or to the east. However, its approximate location is known, and the placement of the southern tract is much more precise, although I’ve deliberately matched its western boundary with today’s Little Creek, rather than its slightly different location three centuries ago. Since the English had a habit of unimaginatively (and often misleadingly) naming any band of Indians after the waterway on which they lived, the Nanticokes on Broad Creek became known as the Broad Creek Indians, and their settlement was called Broad Creek Town. If they gave it a name of their own, it was never recorded. 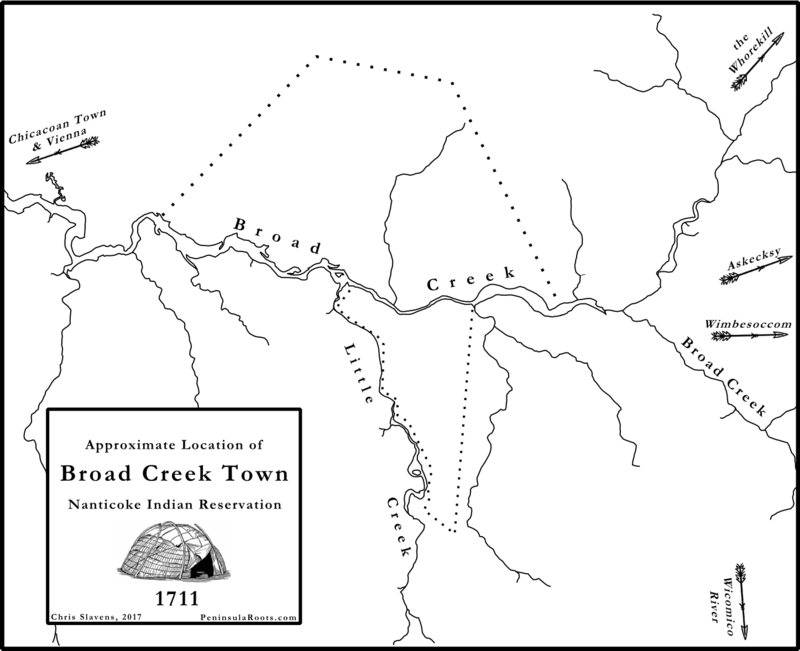 The approximate boundaries of Broad Creek Town based on the original 1711 surveys. Little is known of Broad Creek Town, other than its location. Was there a central village, or were the residents spread out? Did they live in traditional wigwams, or European-style cabins? We can’t be sure, but the best guess is probably “all of the above.” The historian J. Thomas Scharf later reported that they “cultivated the land to some extent” and built a “harbor.” Additionally, they probably interacted with the residents of Askecksy, a nearby Indian River Indian reservation established at about the same time. A little more is known of the leadership of the Broad Creek Indians, but not much. The records of the time mention a number of Nanticoke leaders—notably Panquash, whose leadership stretched from the 1690s into the 1740s—but rarely specify whether they were from Chicacoan or Broad Creek. One such leader was Rassekettham, who accompanied Panquash and Tom Coursey in 1713 to inform the English that the tribe no longer recognized its former emperor, Asquash, who had moved to Pennsylvania. They also inquired as to whether the English had conspired with Asquash to kill Panquash and Rassekettham, and were assured that they had not and would not. Though Rassekettham was not explicitly identified as a Broad Creek Indian, the tributary known as Rossakatum Creek or Rossakatum Branch is assumed to have been named after him. It is likely that he was the chief of the Broad Creek band in 1713. Another probable leader was King Toby, who, with fellow Broad Creek Indians Lolloway and Whist, traveled to the county court held at Dividing Creek in 1725 to complain that some of the Caldwells had mistreated them in some way. Lolloway might have been the same Indian named Lolloway who had been assaulted so badly in Somerset Parish the previous year that he nearly died. Other incidents reported in and around the various Indian reservations indicate that tensions continued to escalate during this time. In the spring of 1742, the Nanticokes, Choptanks, Indian River Indians, Pocomokes, and some visiting Shawnees met in Wimbesoccom Neck to discuss a plot to massacre the local settlers and reclaim the Eastern Shore, supposedly with the help of the Iroquois Confederacy and the French. The tale of “the plot in the swamp” has been told elsewhere, but a few details are worth noting. Wimbesoccom Neck consisted of the land east of Wimbesoccom Creek (today’s Gray’s Branch) and north of the main branch of Broad Creek, which flows through today’s Trap Pond. The neck stretched into the outskirts of what would later be called Gumborough Hundred, and was probably heavily wooded and sparsely settled—an ideal location for a secret powwow. Interestingly, some of the Broad Creek Indians spoke of a “logged house” stocked with weapons, located a few miles into the swamp. Their leaders at this time were known as Simon Alsechqueck and Captain John. But the plot was discovered and foiled, and numerous Indians arrested, and the tribal leaders were forced to sign an extremely restrictive treaty. Henceforth, the Nanticokes could no longer elect an emperor, and every member of the tribe was forbidden to own a gun without obtaining a license from the governor. It was the last straw. Just two years later, Simon Alsechqueck requested and received permission for the tribe to migrate north and live among the Iroquois, and by the 1750s, Broad Creek Town was said to be deserted. In 1768, the provincial government authorized commissioners to sell what had become known as the Indian Lands, and according to later deeds, Joseph Forman purchased 518 acres at the western end of the northern tract, and John Mitchell purchased 2,236 acres. Barkley Townsend acquired part of the southern tract prior to 1776. Following Mitchell’s death in 1787, his portion was sold to a number of buyers including George Mitchell, George Corbin, and John Creighton. Decades later, Forman’s heirs divided his parcel into two lots and sold one to Dr. James Derickson, and the other to Benjamin Fooks and Kendall M. Lewis. Today, the town of Laurel occupies much of the site of Broad Creek Town, and continues to grow, making archaeological investigation difficult. Even so, the stone artifacts that frequently turn up in nearby fields, and local names like Rossakatum and Sockum, survive to remind us of the first people to call Broad Creek home. The Nanticoke Historic Preservation Alliance invites the public to its annual Chicone Village Day, which will be held on Saturday, April 29th, at its Handsell property in Dorchester County. The NHPA was formed in 2005 to purchase and restore one of Dorchester County, Maryland’s most interesting and intriguing historic structures, an old ivy-covered brick building located in the middle of what is known as “the Indiantown”. After just a little bit of research, we knew we were on to something BIG. As the layers of the story unfolded, through research in archives, deeds, Wills and historic family letters, a better yet not fully complete story emerged of native people, licensed Indian traders, English settlers, British attacks, merchant activity and structural devastation. The location is notable for its connection to all three of the major groups to call the neighborhood home during the colonial era: Nanticoke Indians, free and enslaved blacks, and English settlers. Since purchasing the property, the NHPA has worked to restore the brick house, and has erected authentic native structures. For more information, visit restorehandsell.org. During the last couple of years I’ve written several articles about the Sockum family, notable for their unique surname and probable connection to the Nanticoke Indians. It’s a bit easier to research an unusual name like Sockum than others that are associated with the Nanticokes and Moors, such as Clark and Johnson. The name Ridgeway might seem, at first glance, to be similarly mainstream, but a closer look at the Ridgeway family reveals that their name wasn’t originally Ridgeway, and they can be traced to a specific neighborhood in Sussex County. Considering their association with one of the oldest legends about the Moors’ origins, they are certainly deserving of more attention than they’ve received. Notable Ridgeways include Eunice Ridgeway (1813 – 1896), the wife of Levin Sockum; and Cornelius Ridgeway, who was described as the “patriarch” of the Cheswold Moors in 1895, and who related a version of the legend in question. A white woman settled in or near Angola Neck, southwest of Lewes and in Indian River Hundred, roughly fifteen to twenty years before the American Revolution (i.e., 1756 – 1761). She was either Irish or Spanish, or, in one version, Irish with a claim to an estate in Spain. Her name was Regua, Señorita Requa, or Miss Reegan. She purchased some newly arrived slaves in Lewes, one of whom was very handsome. According to most versions, he could speak Spanish, and told her he was a Spanish and/or Moorish prince who had been sold into slavery. In one version, his name was Requa. The two married and produced mixed descendants who were scorned by the local whites, yet did not wish to marry the local blacks, so they either intermarried amongst themselves or married Indians. Their descendants in Indian River Hundred were numerous. Red hair is often mentioned. The name Regua (or Requa, etc.) evolved into the surname Ridgeway. The facts are less dramatic, though they don’t disprove any of the plot points listed above, and are remarkably compatible with them. John Regua, Indian River Hundred, 1740s – 1790s? A mulatto whose name was recorded as John Rigway, John Regua, John Rigwaugh, John Rigwaw, and John Rigware, among other similar spellings, was living in Indian River Hundred as early as the 1740s. His daughters were baptized at St. George’s in 1748, and he purchased nearly 300 acres of land near Swan Creek from Cord Hazzard between 1753 and 1754. Variations of his name appear on tax lists throughout the following decades, and in my opinion, most of these creative spellings suggest that the name was not pronounced like the English surname Ridgeway. It seems more likely that the writers were struggling to spell a name which was unfamiliar, and probably foreign. Although Regua is a rather obscure term, it could very well be Portuguese. Peso de Régua (or Pezo de Regoa) is a city in northern Portugal, and similar names can be found in Spain and in the Pacific. It should perhaps be noted here that another surname suspected to be of Portuguese or Spanish origin, Driggas or Driggers (possibly derived from Rodrigues or Rodriguez), appears in Indian River Hundred as early as 1770. Little is known of John’s immediate family, and it’s difficult to connect the dots between him and later generations with certainty, but it’s likely that he had sons named William and Isaac, who, like him, appear in early tax lists for Indian River Hundred, as well as the records of St. George’s. In July 1785, William and Jane Riguway baptized a child who had been born nearly a year earlier, and just a few weeks later, Isaac and Lydia Riguway baptized a daughter named Allender. Isaac’s fate is unknown, but William appears in a number of records including the 1820 census (which vaguely described him as being 45 or older), and died before November 1826. William Rigware, Sr., enumerated in 1820 and most likely the same man who was a taxable as early as 1774, and who is assumed to be John Regua’s eldest son. Interestingly, William’s household included one female slave who was 45 or older in 1820. Peter Rigware, age unknown, enumerated in 1810. John Rigware, enumerated in 1810 and 1820 with a birthdate range of 1776 – 1794. He is most likely the same man who appears in the 1830 census as John Rigway, aged 55-99, with a birthdate range of 1731 – 1775, and again in the 1850 census as 73-year-old John Ridgeway, living in the household of Nathaniel Clark in Lewis and Rehoboth Hundred. Comparison of these slightly conflicting records suggests that he was born circa 1776. Jacob Rigware, enumerated in 1820 with a birthdate range of 1776 – 1794. In 1850, a 60-year-old Jacob Ridgway was living in the household of John and Hetty Harmon in Broadkill Hundred. If they are the same man, then Jacob was born circa 1790. With the exception of the enigmatic female slave living in William Rigware’s household in 1820 (who may very well have been a family member), all of these men and their family members were described as free colored persons or mulattoes. Although researchers using resources like Ancestry.com will find transcribed spellings like Rigwars and Rigwan, a closer look at the handwritten records suggested that the correct spelling is, indeed, Rigware. It should be noted that during this period, the family remained concentrated in Indian River Hundred. The 1850 U.S. Federal Census is notable for the amount of information it provides. Previously, only heads of household were named, and the members of the household were vaguely listed by gender and age ranges. In 1850 (and in every census since), each member of the household was identified by name and age. When it comes to the Rigware family, the 1850 census provides evidence for two important trends. First, they had begun to migrate northward, appearing in Lewis and Rehoboth Hundred, Broadkill Hundred, and Cedar Creek Hundred. Second, the name had been changed to Ridgway in certain instances. Confusingly, the 1850 census also includes a number of Ridgeways who might or might not be related to the Rigwares. 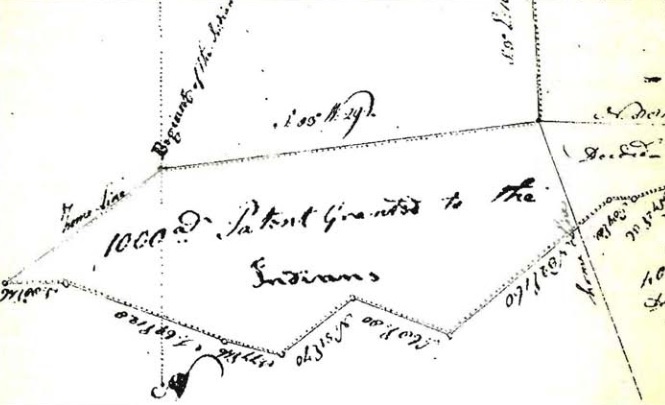 Connections to both New Jersey and Indiana are noted, which ought to interest anyone researching Nanticoke genealogy. However, I’ll ignore these households for the moment and focus on those which can reasonably be assumed to be related to the Rigwares of Indian River Hundred. As was mentioned previously, John Ridgway, a 73-year-old mulatto, was living in the household of Nathaniel Clark in Lewis and Rehoboth Hundred. The name Clark, of course, has been associated with the Nanticoke Indian Association since its beginnings, and it was Lydia Clark who first recited a version of the Romantic Legend in 1855. Nathaniel’s wife was named Unicey, and they also had a daughter named Unicey, which might suggest some connection to Eunice Ridgeway, who was living with her husband, Levin Sockum, in Indian River Hundred at the time. It’s possible that the elder Unicey was John’s daughter, in which case her maiden name would have been Rigware or Ridgway. Some relationship between all of these individuals seems likely. 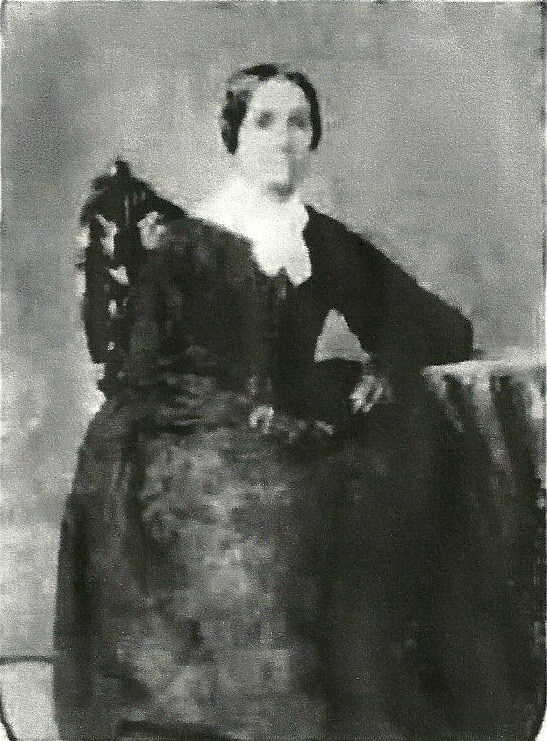 Eunice White Ridgeway, wife of Levin Sockum, 1813-1896. Another John Ridgway was living in Broadkill Hundred at the time, though this one was 35. His wife, Sophia, was 20, while a third member of the household, 18-year-old Matilda Ridgway, may have been a younger sister. Also in Broadkill Hundred was the household of John Harmon, who was 25. The only other members were his wife, Hetty, who was 20, and Jacob Ridgway, 60. He was the father of Cornelius Ridgeway, who was later described as the patriarch of the Cheswold Moors, and who remembered a version of the Romantic Legend. He continued to migrate northward between 1850 and 1860; when one considers his assumed residence in Indian River Hundred between his birth around 1804 and his father’s death in 1826, he is practically a direct link between the Indian River and Cheswold communities. By 1860, he, too, had changed his surname to Ridgeway. Another person of interest in the 1850 census is a mulatto named Tilman (or Tilghman) Jack, who was living in Dover Hundred with his wife and six children. By 1870, he had become Tilghman Ridway and was living in Northwest Fork Hundred, near Seaford; by 1880, Tilghman Ridgeway and family were back in Dover. It should be remembered that Simon Rigware of Indian River Hundred was called “Simon Rigware alias Jack” in 1840. The significance of the Jack name is unclear. By 1860, William Rigware had become William Ridgeway, and had moved his family to Duck Creek Hundred. Personally, I believe the change from Rigware to Ridgeway was deliberate. The former spelling, which followed older spellings like Rigwaugh and Regua, was used consistently for decades. I find it hard to believe that multiple individuals previously known as Rigwares suddenly became Ridgways or Ridgeways in 1850 without having decided to. It was not long after this that Levin Sockum’s family changed both the spelling and pronunciation of their surname to Sockume (sock-yoom). It’s possible that some of the multiracial families who claimed Indian ancestry changed their names during this period in a subtle attempt to improve their social status. Rigware was a mulatto name, Ridgeway was a white name — or so they may have reasoned. This is not to say that they were attempting to claim to be white; they continued to be described as mulattoes, and sometimes as blacks. Yet Weslager wrote of some of the Cheswold Moors successfully “passing” for white and moving away. Cornelius Ridgeway — who was probably the great-grandson of John Regua — was talking about his own family’s history when he told a journalist about the legend of Señorita Requa in 1895, and had himself been a Rigware as a young boy. Although there is no evidence that the Ridgeway family associated with the Nanticokes and Moors is descended from a white woman who married a handsome slave on her plantation in the Angola area in the 1750s, it’s a matter of fact that a free mulatto named John Regua bought a considerable amount of land in the right area during the right time period, and his descendants lived in Indian River Hundred for nearly a century before they began to migrate northward, and his surname evolved into Rigware by the late 18th century and Ridgeway by the mid-19th century. These facts are delightfully compatible with the core points of the Romantic Legend. I should note at this point that there is no obvious connection to the historical Nanticoke Indians who lived along the Nanticoke River. I’ve called Ridgeway a Nanticoke surname in the sense that it is associated with the modern Nanticoke Indian Association and related groups in Kent County and New Jersey. This article might have raised more questions than it has answered. Who was John Regua? Where did he come from? Where did he come by what seems to be a Portuguese name? Is it a coincidence that men named Driggas were among his neighbors, and Angola Neck was named after a major Portuguese colony? Other surnames with a possible Portuguese or Spanish connection are found throughout the colonial records of the peninsula, such as Gonsolvos (Gonçalves), Francisco, and Dias. Some of them were associated with the Cheswold Moors. When one considers these curious facts, the legends of the Nanticokes and Moors — including not only the Romantic Legend, but also tales involving shipwrecked pirates — begin to sound surprisingly plausible. By the beginning of the 18th century, the dwindling peninsula Indian tribes had been herded, through a series of wars and peace treaties, into several settlements, some of which were officially recognized and reserved for them by the colonial governments, and some of which were simply located on unclaimed land. One of the latter was the last refuge of a band of Indians – probably Assateagues – who had been forced to move several times, leaving the Buckingham area in eastern Somerset (now Worcester, near Berlin) at an unknown date, and migrating north in search of a new home. They settled at a place called Assawamen, which was probably a tributary of the Sound known as Indian Town Branch (now Dirickson Creek), but moved north again to the south side of Indian River, which was the de facto boundary between Maryland and Pennsylvania at the time. The subject of this article, their final recognized settlement, was in existence by 1705, and was known by several similar names, including Askeksy, Askekesky, Askeckeky, Askekson, Acksquessance, and Askquessence. The Indians themselves, because they had settled near the Indian River (also known as the Baltimore River) , became known as the Indian River Indians. It should be noted that this name referred to this specific band of Indians, although others lived on both sides of the river. Their name for themselves does not appear in any records from the period. The so-called Indian River Indians first appear in official records dated May 1705, when their chief Robin appeared in Annapolis and signed a peace treaty on behalf of “Queen Wyransconmickonous.” Representatives of the Nanticokes and Choptanks also signed the treaty. Robin went on to tell Governor John Seymour that his people had “Extremly Suffered of Late Years by being disturbed & Expulsed from their several Settlements in Towns,” and were living in a town at the head of Indian River, but were “Continually Threaten’d to be Driven from thence…” He requested that the land on which their settlement was located, as well as one thousand adjacent acres, be reserved for the tribe’s use. The request was approved. 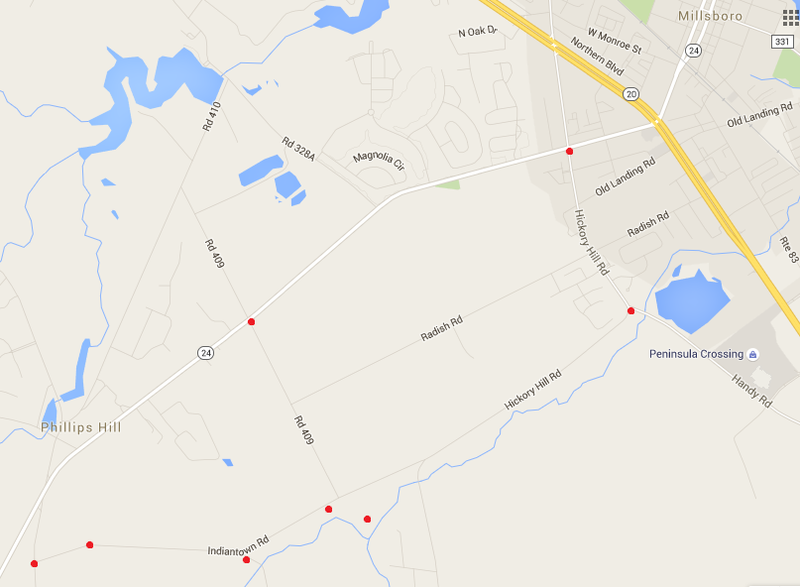 In modern terms, Askeksy was located south of Millsboro between Irons Branch and Route 24. The branch was known as Indian Town Branch or Indian Branch during the 18th century, and clearly matches the southern boundary of the tract. This boundary more or less survives as Indian Town Road (which was known as Injun Town Road for decades and as recently as a few years ago) and a portion of Hickory Hill Road. The location of the northwestern boundary is a bit less clear, but it seems like Route 24 follows it roughly, or was at least laid out in relation to portions of it. The following map shows how modern roads roughly outline the old reservation over three hundred years after it was established. Based on descriptions of nearby tracts surveyed for William Burton, as well as modern estimates of the extent of the Pocomoke or Cypress Swamp prior to drainage and timbering efforts, the reservation was probably somewhat swampy, or at least very close to the swamp’s northern edge. The description of a tract named Panter Swamp mentioned a waterhole on or near the west prong of Indian Town Branch. There were still black bears and timber rattlesnakes in the area at the time. At about the same time that Askeksy was established, most of the Nanticokes moved from their reservation known as Chicacoan Town, near Vienna, to a site on Broad Creek which came to be known as Broad Creek Town. Aside from the fact that their leaders and Robin appeared in Annapolis at the same time, there is little information about their dealings with their new neighbors, just fourteen miles away. Recently I wrote about a so-called horse road which was in existence in 1748, connecting Broad Creek and the head of Indian River; this road may have begun as a trail between the two Indian settlements. Though the Indian River Indians aren’t mentioned in official records nearly as often as the Nanticokes, if the Nanticokes’ experiences during this period are any indication, they struggled to preserve their property and way of life as more and more land was cleared and farmed by the English. Sometimes the white farmers interfered with Indian hunters. Perhaps that’s why they joined the Nanticokes, Choptanks, Pocomokes, and visiting Shawnees at a place called Winnasoccum or Wimbesoccom for a secret powwow in June 1742. The tribes planned to massacre the local English settlers and retake the peninsula with the help of the French, who supposedly promised to land on the coast. The plot was discovered and thwarted, several Indians were arrested and interrogated, and in August the leaders of the Nanticokes, Choptanks, Indian River Indians, Pocomokes, and Assateagues signed a new, highly restrictive peace treaty. Tom Hill and Robin (probably the first Robin’s son) were identified as chiefs of the Indian River Indians. In the years following the suppression of the Winnasoccum Uprising, as the event has been labeled by some, many of the peninsula Indian tribes abandoned their lands and migrated to Pennsylvania. The Indian River Indians had already sold hundreds of acres to local English settlers prior to 1742, and sold the remainder of their reservation to William Burton in 1743. There is no known record of their existence as an organized tribe or band following this sale, and strictly speaking, their fate is unknown. They may have joined the Nanticokes at Broad Creek Town, many of whom moved north in 1744. Perhaps they moved north, too, or perhaps, like some of the Nanticokes, they lingered in the area, intermarrying with whites and/or blacks and producing new generations of mulattoes who gradually adopted English ways and preserved vague traditions about Indian ancestry. If so, it seems likely that some would have joined the multiracial community on the north shore of the Indian River which was in existence as early as the 1840s, and which eventually spawned the Nanticoke Indian Association. The following article and map were first published in the Laurel Star in May 2015. With about 800 houses on the National Register of Historic Places and more than a dozen historic churches in and around the town, Laurel is the kind of place where the past is not only remembered, but celebrated. Many local families can trace their roots back to the 18th century, and some still live on land cleared by their distant ancestors when the Delmarva Peninsula was a wild frontier. Yet one of the most significant and fascinating events in the area’s history is also one of the least known, possibly because it took place when the area was claimed by Maryland. In the following decades, the tribe listened to reports of European expansion, as the Dutch and Swedes settled in the northeast, and the English spread out from the western shore into Accomack and Choptank territory, and beyond. Attempts to resist ended badly. It was with this in mind, perhaps, that Unnacokasinnon, “Emperor of Nantecoke,” signed a peace treaty in 1668. The treaty laid out several rules for the Nanticokes; among them, that they would be required to lay down their weapons if they crossed paths with Englishmen in the woods. Unnacokasinnon also promised to “deliver up” the neighboring Wicomisses, who were his subjects. A Wicomiss man had recently killed an English captain, possibly to avenge the death of his wife. The Wicomisses were subsequently destroyed. In 1698, the Maryland legislature established a large reservation on Chicacoan Creek, but a few years later, at about the time that the town of Vienna was established nearby, most of the Nanticokes moved up the river to Broad Creek. Whether they reclaimed an old village, moved into an existing one, or established a new one is unclear. It seems that the move was prompted by a combination of English harassment and depleted resources. The legislature, reluctant to provoke the tribe, decided to create a second reservation rather than force them to leave. The Nanticoke village on Broad Creek became known as Broad Creek Town, and its residents were sometimes called the Broad Creek Indians. At that time, the area was part of Somerset County (Worcester and Wicomico Counties did not yet exist), and would not be ceded to Sussex County for nearly seventy years. During the next three decades, many English settlers were granted land in the surrounding area. Most of them were tobacco planters from Maryland and Virginia, drawn to northern Somerset by affordable land. At that time, the territory east of Broad Creek Town was part of the immense Pocomoke Swamp. In addition to clearing the land of trees, the settlers had to drain it, which was accomplished with a network of ditches. As more and more land was cleared and cultivated, the Nanticokes began to feel cornered. For generations they had lived in long-term villages along the coast, rivers, and creeks for most of the year, and periodically moved inland to hunt. Now they were more or less confined to their two reservations. Dishonest traders’ use of alcohol to intoxicate them and trick them into unfair business transactions also fueled rising tensions between the peninsula Indians and their English neighbors. In 1721, some of the tribes even asked the English authorities to prevent traders from selling or giving them rum. By the spring of 1742, the situation was nearing its breaking point, and when a party of twenty-some Shawnee visited Chicacoan Town to share news of a French and Iroquois plot to drive the English from the Eastern Shore, the Nanticoke leaders were receptive to the idea. Colonel John Ennals noticed the visitors, but thought nothing of it at the time. The Shawnee stayed for about eleven days, then returned to the north. A couple of weeks later, in early to mid-June, the Nanticokes, Choptanks, Indian River Indians, and Pocomokes quietly left their respective reservations and traveled to a place called Winnasoccum. The exact location of Winnasoccum is unknown, but colonial land records referring to Wimbesoccom (or Wimbasacham, Wimbesacum, etc.) Creek and Neck, and later maps featuring Sockum Creek, suggest that it was about six miles east of Broad Creek Town—or, in today’s terms, in the area between Pepper Pond and Trinity United Methodist Church. Once numerous Indians had assembled at Winnasoccum, a week-long powwow commenced. The details of the plot were explained: In the near future, the Shawnee would secretly return and help the Nanticokes execute a surprise attack on the English settlers during the night. Men, women, and children would be slaughtered, and the attack would continue for as long and as far as possible. Meanwhile, the French, who had been grappling with the English for control of North America for decades, would land on the coast. For the Nanticokes and other tribes, it was to be a desperate, all-or-nothing, last stand against the invaders who had stolen their lands, forced them onto reservations, and destroyed some of the neighboring tribes. In celebration of the plan, some painted their bodies and danced to the sound of beating drums, brandishing tomahawks and firing guns, and a medicine man from Indian River brewed a poison to be dumped into their enemies’ water supply. Had the gathering escaped the notice of the English, the history of the peninsula might have unfolded quite differently. But the white residents of both the Broad Creek area and Dorchester County reported their Indian neighbors’ suspicious absence to the authorities in Vienna, and on June 22nd, Colonel Ennals wrote to Colonel Levin Gale, warning that all of the Indians of Dorchester were missing, and that the Broad Creek Indians had left their village to hunt at Winnasoccum. He didn’t believe they were hunting, because the old men, women, and children had gone, too, instead of remaining behind to tend the crops. Gale forwarded the letter to Governor Samuel Ogle in Annapolis. During the next week, several Indians were questioned. Four Choptanks confirmed that the purpose of the gathering at Winnasoccum had been to discuss the plot against the English. By July 4th, at least twelve Indians had been interrogated. Some claimed that the Broad Creek Indians had told them about a secret log structure on a small island about two or three miles into the swamp, stocked with guns, powder, shot, and many poison-coated, brass-pointed arrows. Meanwhile, the Council of Maryland directed the commander at Vienna to order any Indians in the swamp to surrender their weapons, and to guard the routes out of the swamp to ensure that none escaped to contact the northern tribes. The Eastern Shore forces succeeded, and on July 12th ten Indians were questioned at a meeting of the Council in Annapolis. The leaders claimed that they had gone to Winnasoccum to hunt and elect an emperor, and denied the existence of any log structure stocked with weapons. Others claimed that they had gone there only because they were told to, and learned of the plot after they arrived. The Council did not take long to make a decision. On the same day, some of the Indians were warned that they could have been severely punished, and that the English could take all of their lands, but would instead show them mercy. They were released on the condition that they would inform the nearest Justice of the Peace if they saw any “strange Indians.” However, their leaders, including Simon Alsechqueck and Captain John of Broad Creek, remained in custody for another twelve days. On July 24th, they were released after signing the most restrictive treaty in the history of the Nanticokes’ dealings with the English. They could no longer elect an emperor, and every member of the tribe was forbidden to own a gun without obtaining a license from the governor. The failure of the plot may have been the last straw for the Nanticokes. Shortly thereafter, an exodus began. In 1744, Simon Alsechqueck and other Nanticoke leaders requested and received permission for the tribe to leave the Eastern Shore and live among the Six Nations of the Iroquois Confederacy. The refugees made their way north, paddling dugout canoes down the Nanticoke River and up the Chesapeake Bay. They joined other displaced tribes along the Susquehanna River for a time, but eventually traveled farther north and settled in French territory. Others moved east, and lived among the Indian River Indians. Their multiracial descendants would found the Nanticoke Indian Association 180 years later. By 1754, Broad Creek Town was deserted. Any Nanticokes who didn’t move away probably lived in cabins on undesirable tracts of land, and were gradually absorbed by the white or black populations through intermarriage. Only stone artifacts and ancient names like Rossakatum, Wimbesoccom, and Assacatum remained to remind future generations of the first people to call Broad Creek home. This week the Laurel Star (and presumably the Seaford Star) published an article I wrote about the Nanticoke Indians about a year ago, as well as a rough map of the area showing the approximate locations of the Nanticoke, Choptank, and Indian River reservations in 1742. It was in that year that the surviving tribes gathered near Trap Pond and planned to wipe out the English settlers and reclaim the Eastern Shore with the help of Shawnee warriors and French forces. The plot was discovered and foiled, otherwise the history of the peninsula might have unfolded quite differently. I’ll post the full article in a week or two, as I’d like for everyone who’s interested in the subject and able to do so to support the newspaper and buy a copy, but in the meantime here’s the map. Click to enlarge. A few months ago I posted an article entitled “Sockum” and the Nanticokes of Broad Creek, which explains why I believe the name Sockum, as both a surname and place-name, followed Nanticoke refugees as they drifted across the Eastern Shore between 1744 and 1850. When researching the subject, I missed at least one fact, which I just noticed yesterday. It might not be all that important, but every little bit of information helps. Scharf’s History of Delaware features a list of taxables in Dagsborough Hundred in 1785. This list proves that a James Sockam and a Widow Sockam (meaning the widow of a deceased Sockam) were living in the hundred at that time, which included the area later known as Gumborough Hundred. Interestingly, there was a James Sockam living in Nanticoke Hundred, Somerset County (probably in what would become Little Creek Hundred, Sussex County, following the resolution of the boundary dispute) in the 1750s. There was also a James Sockum living in Sussex County in the early 1800s. Without more information, it’s impossible to know how many Jameses we’re dealing with, but it seems likely that there were at least two or three generations of men named James Sockum (or Sockam, Soccom, etc.). It should be remembered that just as there were Nanticoke reservations along Chicacoan Creek and Broad Creek, there was a thousand-acre “Indian River Indian” reservation located near a tributary of Indian River known today as Irons Branch. Injun Town Road, located in Dagsboro Hundred, south of Millsboro, seems to trace the southern boundary of this tract. The Indian River Indians sold sections of the reservation in the 1730s and early 1740s, with the final tract being sold in late 1743. Presumably some of them migrated north with the Nanticokes, and presumably some of them stayed in the area, eventually moving to the north shore of Indian River. It’s possible that the James Sockam of 1785 was living with or near descendants of the Indian River Indians in the neighborhood of their old reservation. The Indian River Indian reservation, known as Askeckeky or Acksquessance, was located south of present-day Millsboro.